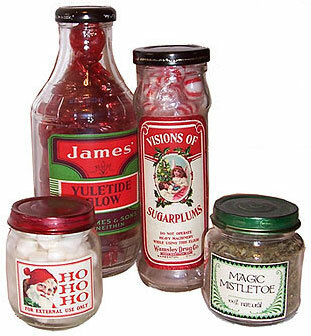 This simple project uses images from the Christmas Labels collage sheet and a few basic supplies to turn ordinary glass bottles into clever gift containers. A label sheet from Ten Two Studios. 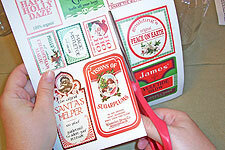 I used the Christmas Labels for these samples. Glass bottles. I save all the clear glass bottles from the kitchen. Matte medium and a sponge or brush. 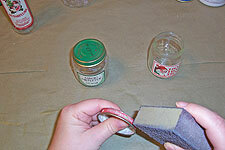 A sanding block, if you wish to remove the coloring from metal lids. Alcohol inks and a brush, if you wish to color metal lids. 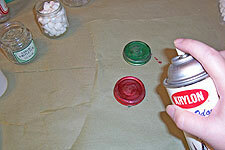 Spray sealer, if you recolor metal lids with inks. Start with clean, dry bottles. I let mine soak in the kitchen sink for an hour or so, then peel any labels off. 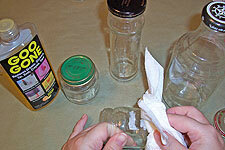 Once they’re dry, any glue residue can be removed with a little bit of Goo Gone. 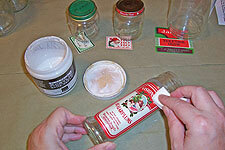 Cut out the labels you’ve chosen, and make sure they’ll fit on your bottles. Some of the labels on each sheet were designed to be adjustable—they have sections you can trim away to make them a bit smaller. 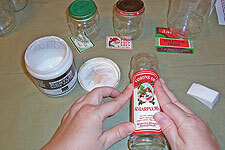 Grab a label and its bottle, and work quickly. 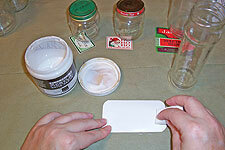 First, apply a light coat of matte medium on the back side of the label, and set it aside. 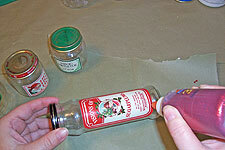 Apply a light coat of medium to the section of the bottle that will be covered by the label. Remember, work quickly, and don’t worry about being to precise about this step—you’ll clean up any excess medium left beyond the label shortly. Apply a very light coat of medium over the label, paying particular attention to the edges, and smoothing the label down as you work. Grab a baby wipe, and clean off any excess medium left on the glass. 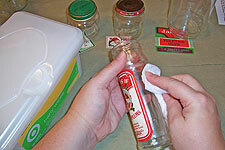 Get as close as you can to the label without wiping the edge. Set this bottle aside to dry, and move on to the next one. I left these sample bottles fairly plain—but I did find one or two that needed a bit of glitter glue here and there. Here’s a tip: add the glitter glue ONLY to places that still have medium on them. 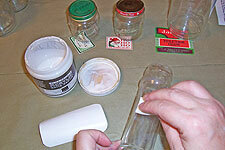 The glue will not stick will to plain glass—in fact, it will often pop right off when handled. While the glitter glue is drying, take a look at the lids. 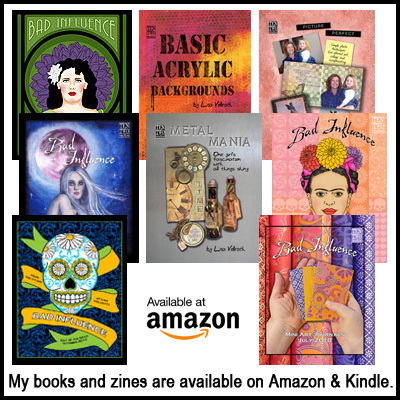 I prefer metal lids, which can be sanded with a sanding block to remove any coloring that doesn’t match. If I’m stuck with plastic lids, the best I can do is swap them around on different bottles until I have one that matches my current project, or paint them with plastic model spray paint. To remove the colored finish from a metal lid, use a very rough sanding block. Most lids will give up their color without too much work. These two lids were the right colors, but had wording on them I wanted to remove, so I just sanded enough to make them unreadable. 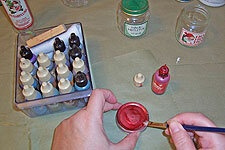 A few drops of alcohol inks applied with a brush will turn the sanded lids pretty colors. Remember to seal the lids with a spray sealer if you use inks on them!